Personalized Medicine. With new knowledge of the human genome, doctors can find medicines to cure diseases, see if a person is more susceptible to a disease before it occurs, and locate genes associated with certain diseases. For example, in 2010 five-year old Nicholas Volker had more than 100 surgeries to correct an intestinal disease. After sequencing his genome, doctors discovered the mutation that caused his condition and they transplanted stem cells to replace white blood cells to help him recover. Typical drugs are designed to treat the majority of individuals in a population. The mapping of the human genome is helping doctors create personalized medicines that work better and faster with fewer side effects. For example, ribavirin, a drug to treat hepatitis C, costs $50,000, but only works on 50% of people who take it. 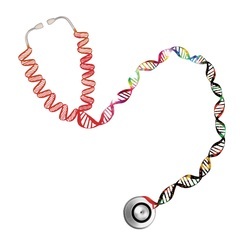 Through genome sequencing, doctors can predict who will respond to treatment. Risk assessment. Genes are a large factor in a person's susceptibility to diseases like cancer. With advances in genomic technology, scientists hope to have personalized genetic tests to predict who is at greater risk for many common conditions, allowing doctors to detect, treat and prevent diseases more efficiently. Better crops and animals. Scientists can apply their knowledge of human genetics to plant and animal genetics and create healthier crops that are less prone to disease, insect infestation, and drought. This will allow farmers to use fewer pesticides on foods, making them healthier and safer. Likewise, farmers can breed animals that are healthier with fewer chances of disease.